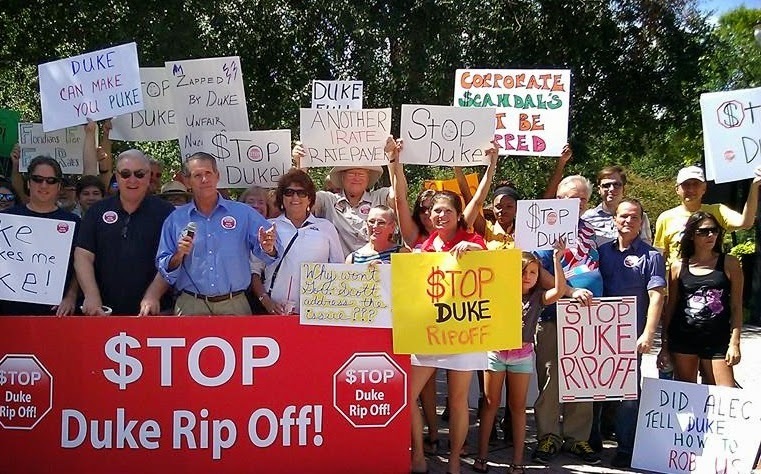 Last Saturday in St. Petersburg, the Sunshine State Clean Energy Coalition came together with the Stop Duke Ripoff Coalition and other community leaders, including State Representative Dwight Dudley, to speak out against Duke Energy's policies that hurt rate payers. Duke, the largest energy company in the United States, has been in the news recently for their new billing system that forces many of its customers into a much higher rate for using the same amount of energy. This new billing practice wasn't the only thing with which rally attendees were frustrated. The unpopular Advanced Nuclear Cost Recovery fee, Duke's refusal to returning all the money it took for a nuclear power plant that was never built, and their current request to the Public Service Commission (PSC) to reduce their Energy Efficiency Standards by 95%. The PSC oversees and regulates investor-owned power companies in Florida and are in the works to make a decision on the Energy Efficiency standards as early as next month. Sierra Club has been strongly opposed to the creation of new dirty power plants in place of increasing energy efficiency. A efficiency standards reduction could lead to higher rates for consumers, and open the door to more unnecessary power plants being built. This is great news to investor-owned utilities, who make money on building new dirty power plants, but end up costing rate payers more, and contributes to climate disruption. A recent University of Florida study on the effectiveness of the FEECA process (Florida Energy Efficiency and Conservation Act) and found "the benefits exceed the costs," "customers are not burdened," and it is "supported by stakeholders." Contact the Public Service Commission now and tell them to maintain high Energy Efficiency Standards, which would create jobs, protect the environment, and save ratepayers money. You can reach them HERE.